CLOCS (Construction Logistics and Cyclist Safety) exists to reduce road danger from construction industry vehicles. It focuses on three workstreams: improving vehicle safety, ensuring road danger reduction is considered as important as health and safety on site; and encouraging the wide adoption of best practice. The CLOCS standard is for construction industry clients to ensure their supply chain is compliant with effective practice. It brings together developers, construction companies, operators, vehicle manufacturers and regulatory bodies to improve freight safety. FORS, the Fleet Operator Recognition Scheme, is for contractors to demonstrate compliance. This 'direct vision' cab design is similar to the Safer Urban Lorry which LCC has long called for the construction industry to adopt, with a lower driving position, and large glass areas to the front and side that give the driver a direct view of pedestrians and cyclists in close proximity to their vehicle. The conference began with an introduction from Sir Peter Hendy, Commissioner at Transport for London, who talked about the need for a compliant and safe set of vehicles on London’s roads. He said he was fantastically encouraged to see the safer vehicles, and that TfL are working towards a point where they will say if contractors want to work on a TfL site, it will have to be one of those. He talked about the Safer Lorry scheme, which is due to come into force in September to ensure everyone has fitted safety equipment on their vehicles. He also talked about other measures that operators should be taking, including looking at changing and consolidating freight movements. He cited the example of Bond Street, where retailers have decided that they want to do something about the proliferation of vans and lorries – including the 54 different companies that pick up trade waste from Bond Street shops. Next Glen Davies, programme manager for the Freight and Fleet Programmes at Transport for London, talked about the importance of speaking to the whole supplier chain: the people who generate the need for freight, vehicle manufacturers, and others. The Safe Urban Driver training that LCC has championed has been extremely popular and is now being rolled out across the UK. Vehicle manufacturers and dealers are now fitting safety equipment as standard - camera systems and warnings are part of the dealer system. At the same time, the need for safety mirrors indicates an acceptance of the blind spot. The newer direct vision cabs are a big improvement. Glen also talked about the ground conditions: too many off-road capability vehicles are being used on urban roads, often without consideration of the work they’re expected to do. Off-road tippers have bumpers and bodywork twice as high off the ground than other lorries and are more likely to push a cyclist or pedestrian down than push them away. There are many of them wprking in London - but 99.5% of work they do is on road. Gordon Sutherland of Thames Tideway Tunnel and Catherine Beeckmans of Lend Lease are both CLOCS champions, and talked about the need for senior management buy in. Catherine highlighted the potential adverse commercial consequences of not signing up to the CLOCS standard. Cynthia Barlow OBE, Chair of Roadpeace, and Kate Cairns, founder of See Me, Save Me, both spoke powerfully about their experiences of construction industry related road deaths and the need to eradicate these avoidable collisions, as well as the problems of the Crown Prosecution Service – the treatment of bereaved families by the CPS is rated as poor in 75% of cases. Kate highlighted the urgent need for voluntary action from the industry – legislation takes too long to wait for. Brian Weatherly, the chairman of CLOCS, closed the conference and reminded the audience of the Mayor of London’s comments in the Safe Streets for London report: we should work towards the goal of freeing London’s roads from death and serious injury. A target we should all aim for. Other work showcased at the conference included the trials of significantly lower side-guards that O'Donovan Waste Disposal are conducting with Transport for London, which would provide greater protection. LCC welcomes the work CLOCS is doing towards reducing road danger from construction sector vehicles. 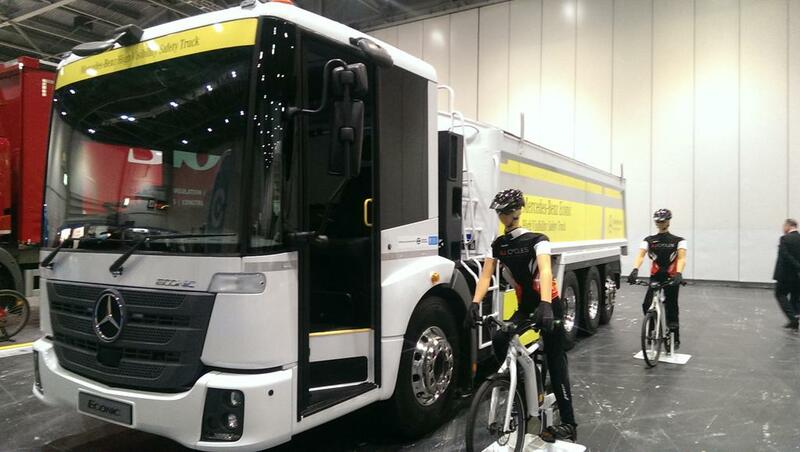 Between 2008 and 2013, 55 per cent of cyclist fatalities in the Capital involved a HGV, a disproportionate number of which were construction vehicles. LCC is also calling for our streets and junctions to be redesigned to provide safe and direct passage for cyclists and pedestrians. Well over 70% of serious injury or fatal collisions happen at major road junctions in the capital each year, often as a result of motor traffic turning left turning across a cyclist's path. These junctions can and must be improved to minimise the danger from turning vehicles and provide safe space for cycling. You can find out more about the CLOCS standard, learn how to sign up as a CLOCS champion and download each of the guides, from the CLOCS website.